I absolutely love essential oils and this time I decided to try rosemary oil which I haven’t tried before. Description: 100% Pure Therapeutic Grade Tea Tree 15ml Essential Oil. Botanical Name: Rosmarinus officinalis Comes in 15ml blue glass essential oil bottle. European Dropper Cap included. Rosemary oil has well known benefits for skin, hair and health, a must-have oil for your home. It is one of the most popular aromatherapy oils that has been used since ancient times as a medicinal and culinary herb by the Greeks and Romans due to its therapeutic properties. It is also great for hair and skin care and is used as an ingredient in several products such as skin care cleansers, soaps, face masks, toners and creams. It is safe for topical application, although dilution with a carrier oil such as jojoba or fractionated coconut oil is recommended. SPEAKING TREE Rosemary Oil is highest quality oil extracted from the leaves and flowers of rosemary plant. Our oils are by far the most effective on the market. For topical use only, need to be diluted with a carrier oil before use. Rosemary Essential oil · Hair Growth And Reduces Hair Fall. · Used as analgesic, anti-septic, anti-spasmodic, carminative. Elevate the spirits, calm the mind, and promote a sense of happiness. About the Product: It Can Be Used For Inhalations, Baths And Massage. It is Excellent For Hair Growth And Reduces Hair Fall. It can be used as analgesic, anti septic, anti spasmodic, carminative. 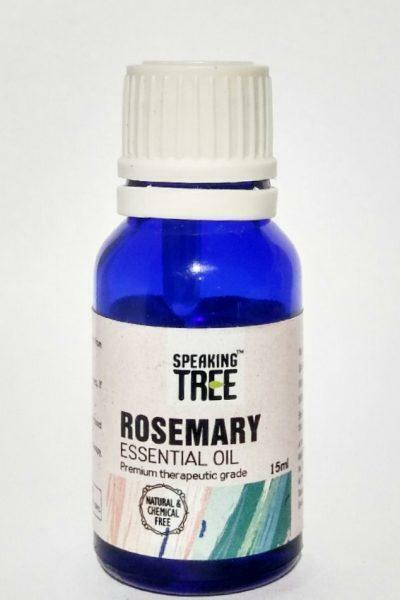 Speaking Tree Rosemary Essential Oil has a fresh, sweet herbal aroma with a mild medicinal undertone. It is known to elevate the spirits, calm the mind, and promote a sense of happiness. The oil comes in a green cardboard packaging which has all the information printed on it. The actual oil comes in a blue glass bottle with an usual oil dispenser. It dispenses oil drop by drop and not at once so it helps in controlling the amount you need. They also give another bottle with a roll on which can be filled with oil and used as a roll on oil to apply wherever needed. The oil is transparent in colour and has a strong camphor like smell which is kind of soothing and not over powering. It smells like you are in a spa – calming & soothing. Rosemary oil helps in maintaining the hair health and helps with hair fall and hair growth and is also anti-septic in nature. I take a few drops of rosemary oil and mix it in extra virgin coconut oil to oil my hair with this conconation. It gives a very soothing and calming effect instantly. I don’t particularly have any hair issues but this product didn’t aggravate any other problem so that’s a good thing. One thing that I noted was that I didn’t have as much hairfall as I normally do when I comb my hair. So I am not sure if it was because of this oil or something else. But I’m adding a plus point to the oil that I noticed less hair fall with this hair oil. I also used it on my skin for over a week but I couldn’t spot any difference or any other benefit which might have taken place due to this oil. This oil feels best when used in bath, it really is very therapeutic and calming in nature. I personally did not find any major hair or skin benefits from speaking tree rosemary oil. But I feel it’s a must buy if you are a fan of essential oils and love their soothing smell and multipurpose uses! The smell of the Speaking Tree Rosemary Oil is very calming and soothing to the senses. Thank you for sharing such a detailed review. I would love to use this for hair massage.